One recipe I turn to quite often for leftover chicken or turkey is Nigella Lawson’s recipe for bang bang turkey salad. You can find it online here. 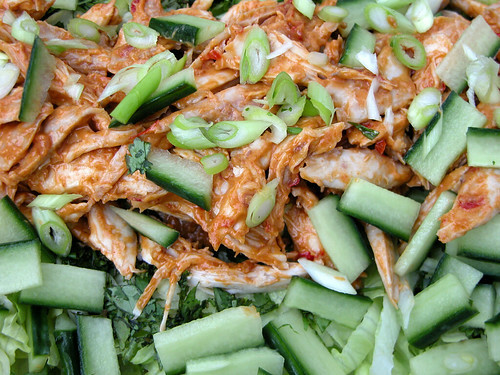 It’s delicious and spicy, and refreshing thanks to the spring onions and cucumber. You can serve it as part of a large party spread, using up other left overs like pie or quiche, and people will think you’ve gone to a lot of effort to create a brand new dish, when, really, you’re just sneakily feeding them your left overs. HO HO HO! Make the sauce by heating the groundnut oil, allowing to cool slightly, then adding the sesame oil, peanut butter, chilli bean sauce, caster sugar, soy sauce, vinegar and water. 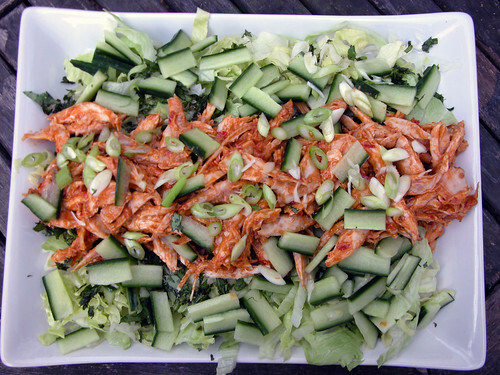 Mix the sauce with the shredded chicken meat and lay it over a bed of shredded iceberg lettuce,which has been covered with the mint and coriander. Finely slice the spring onions, and cut the cucumber into batons. Arrange on the platter.